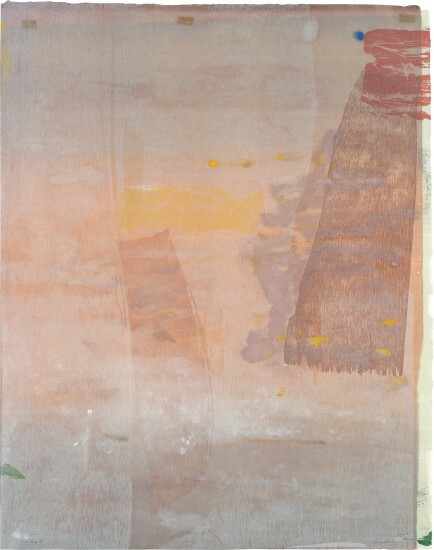 Helen Frankenthaler reused the matrix carved for her 1980 woodcut Cameo in order to create the rich colors and textured elements of the present lot. Monoprint V resulted from Frankenthaler using a proof pulled for Cameo and then adding an uncarved woodblock and finally hand-coloring this impression. Monoprints and Monotypes are both techniques that produce unique works. Generally, Monotypes require that the artist work directly onto the plate — usually a thin and flat surface — from which the impression will be pulled. Monoprints differ from Monotypes in that such works could be made from any number of printing matrices such as woodblocks. Monoprint in colors with hand-coloring in lithographic ink, pastel and Paintstik, on white Japanese Suzuki handmade paper, the full sheet. Signed, titled, dated '11 Feb '81' and annotated with printer's notes in pencil, published by Tyler Graphics Ltd., Mount Kisco, New York, framed.